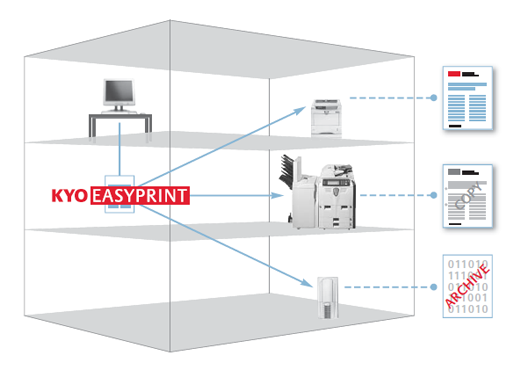 KYOeasyprint 2.0 simplifies all routine document output workflows. Designed for small to mediumsized businesses, this software will increase productivity by turning even the most complex printing routine into a one-click operation. Processing office document workflows without delays speeds up the administrative process, increasing efficiency and lowering administrative costs. Invoice printing: Distribute invoices to all recipients in one simple step. Example: The customer’s invoice is printed on premium company stationery and includes the terms & conditions on the back. At the same time, one copy is sent directly to the accounting department, marked with a COPY watermark, one is printed out in the controlling department and one is automatically archived as a PDF file. Multiple stationery: Print a document on different kinds of paper and with different letterheads. Example: Companies which distribute various brands or offer multiple services require a variety of stationery with different letterheads. KYOeasyprint 2.0 automatically inserts the required electronic letterhead into any type of document so that managing different letterheads is quick, easy and fail-safe. Copy printing: Automatically create as many duplicates as you need. Example: All copies of a document can be printed on one or multiple printers. Copies are automatically watermarked or printed on special paper, and additional forms or text can be included.